Michael Lund of Machias is shown last month waiting for his civil trial to begin at the Penobscot Judicial Center. On Wednesday, Lund was awarded nearly $730,000 in damages due to heat stroke that he suffered while burning a blueberry field in 2012. 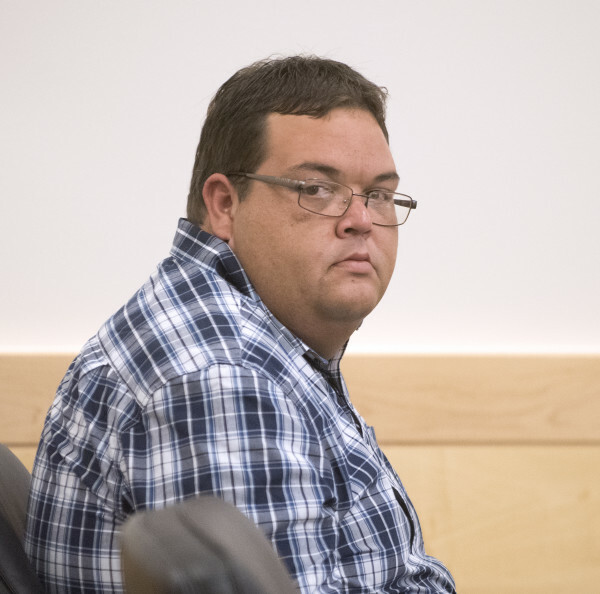 BANGOR, Maine — A judge on Wednesday awarded a Machias man nearly $730,000 in damages for lasting injuries he suffered when he collapsed more than four years ago during the burning of a blueberry field. Michael Lund, 38, sued Milliard A. Whitney & Sons last year. He claimed the company was negligent in preparing him for a kind of work he had never done. Superior Court Justice William Anderson held a jury-waived trial last month at the Penobscot Judicial Center. Lund was called on March 22, 2012, to replace another worker in the burning of blueberry fields, according to trial testimony. Lund had worked previously for Whitney & Sons but had never worked a burn before. He became disoriented during the second burn in the early afternoon but did not recognize the signs of heat stroke, Anderson said in his five-page ruling. Lund collapsed and was taken to Downeast Community Hospital, where his temperature was measured at 108 degrees and he was unresponsive and in respiratory failure. Lund was flown from the Machias hospital to Eastern Maine Medical Center in Bangor, where he spent three days in the intensive care unit. He was released on the fourth day after what doctors’ labeled “a miraculous recovery” but still suffers pain in his right shoulder and lower legs that keeps him from exercising and limits his ability to work and enjoy other activities. Anderson found by a preponderance of the evidence that Whitney was negligent in not educating workers to recognize the signs and possible dangers of heat stroke. The judge also found that Lund was not negligent that day and did nothing to contribute to his own injuries. Lund’s attorney, Travis Brennan of Portland, praised the decision Thursday in a press release. The judge awarded Lund $729,845 in damages — $68,845 in medical expenses, $165,000 in lost income, $400,000 for pain and suffering and $96,000 for his permanent injuries.